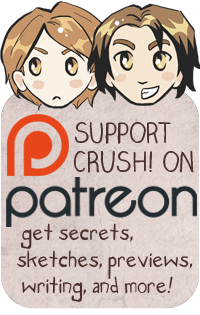 A new page will be up later tonight, so do check back! KoiZ gets up kind of dazed, grabs his shirt from the floor and puts it on kind of clumsy as he heads to the door, flushed, spaced out, muttering to himself.... "Then I'll make them go away." and he doesn't exactly look angry here, mostly spaced out, amazed at being interrupted, and just very serious, going to make them go away. "Koichi!" "Hey, KOICHI! Answer the door!" "It's Me!" at - it's me - we see just who it is... we see Shiro's face... grinning kind of with KoiZ’s goofy smile in the opening of the door, like ain't this awesome! 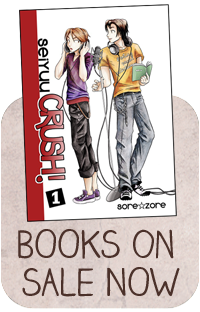 You can become a $10+ supporter of the Seiyuu CRUSH! Patreon to read more!